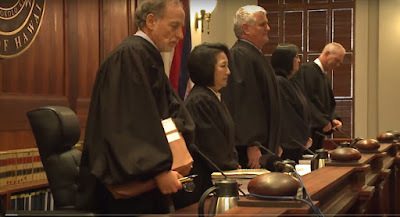 The Hawaii Supreme Court has ruled that several thousand public school substitute teachers are not entitled to millions of dollars in back wages and interest that a lower court had previously awarded. Star-Advertiser. In a unanimous decision, the Hawaii Supreme Court ruled Wednesday that substitute and part-time teachers who worked in Hawaii between 2000 and 2012 were not entitled to the $56 million in back pay and interest that they were seeking. Civil Beat. The Hawaii Supreme Court on Wednesday ruled that public school substitute and part-time teachers are not entitled to back wages or interest on back wages for alleged underpayment by the state over a 12-year period. Pacific Business News. Hawaii’s medical marijuana dispensaries are facing another hurdle after the state’s largest workers’ compensation provider decided to drop their insurance policies. Star-Advertiser. Hawaii Employers’ Mutual Insurance Co., the state's largest workers' compensation insurer, said Wednesday that it sent a 30-day policy cancellation notice to seven medical marijuana dispensaries following a “thorough legal evaluation of state and federal law regarding the production and sale of medical marijuana in the state of Hawaii.” Pacific Business News. Hawaii-based Times Supermarkets is being sold to the Don Quijote Group for an undisclosed price. The 24 supermarkets include 17 Times Supermarket stores on Oahu, Maui and Kauai; five Big Save Markets on Kauai, and Shima’s Supermarket and Fujioka’s Wine Times on Oahu. Star-Advertiser. Don Quijote Holdings Co. Ltd on Wednesday said that an affiliate has executed a stock purchase agreement to acquire Hawaii-based Times Supermarkets. Pacific Business News. The Don Quijote Group will buy Times Supermarkets and its affiliated grocery stores in Hawaii, the companies announced Wednesday. Hawaii News Now. Hawaii managed to hold onto one of the two at-large seats it has historically held on the Western Pacific Regional Fishery Management Council thanks to the governor of the Northern Mariana Islands nominating someone from the Aloha State. Civil Beat. AARP Hawaii is conducting Caregiver Workshops throughout the state this summer. Hawaii Public Radio. Malaysian carrier AirAsia X began its maiden U.S. service between Kuala Lumpur and Honolulu on Wednesday, ushering in a connection between Hawaii and Southeast Asia that has the potential to add millions of dollars to Hawaii’s tourism economy. Star-Advertiser. Scientists, including Tina Weatherby with the University of Hawaii at Manoa School of Ocean and Earth Science and Technology, published a study wherein they reconstructed the skin of endangered green turtles, marking the first time that skin of a non-mammal was successfully engineered in a laboratory. Garden Island. Mayor Kirk Caldwell signed into law a bill that will increase the vehicle weight tax from 5 cents a pound, to 6 cents next year, and 7 cents in 2019. KHON2. City officials said they hope the computer problems that have shut down motor vehicle registration and driver’s licensing operations in all four Hawaii counties since Monday can be fixed by Friday. Star-Advertiser. Experts advise major changes for TheHandi-Van with demand, costs both soaring. KHON2. A California development firm’s newest attempt at subdividing Oahu’s historic Dillingham Ranch ran into community resistance at a North Shore Neighborhood Board meeting Tuesday night, but the board didn’t end up with enough votes to oppose the project. Star-Advertiser. The Hawaii Department of Transportation plans to spend up to $30 million to outfit two gates at the Daniel K. Inouye International Airport to serve the world’s largest commercial jumbo jet. Civil Beat. There's been a long-standing homeless population along the Pearl City bike path. But some say the numbers have been increasing in the past few weeks, with some bikers and joggers saying they're now avoiding the path. Hawaii News Now. Honolulu’s long-anticipated bike-share rental system went live Wednesday, starting with a blessing at the state Capitol for the distinctive turquoise bicycles. Star-Advertiser. Bicycle-Sharing Program Hits The Streets Of Honolulu. Biki features 1,000 bicycles at 100 stations from downtown to Diamond Head. Civil Beat. Honolulu’s bike share program was five years in the making. It's reality now. The next step is shaking out the bugs. KITV. The proposed redevelopment of Hawaii's Aloha Stadium could be pushed back before it even starts following Gov. David Ige's notice that he intends to veto legislation that would allow public-private partnerships. Pacific Business News. Embattled ship 'Falls of Clyde' one step closer to returning home to Scotland. Hawaii News Now. Big Island Dairy was sued Wednesday by the Hawaii Center for Food Safety and Kupale Ookala, a group of local residents, who claim the company is polluting nearby waters with animal waste. Civil Beat. A group of Ookala residents is moving forward with a lawsuit against Big Island Dairy for alleged violations of the federal Clean Water Act. Tribune-Herald. Pohakuloa Training Area sewer, storm water collection system project just 1st phase of multiple improvements. Tribune-Herald. Several weeks of logging in a small Waimea neighborhood has appeared to come to a halt after an injunction was granted by the 3rd Circuit Court and a citation was issued from the Department of Public Works. West Hawaii Today. State Senator Russell Ruderman, the Democrat serving district 2 (Puna), offered constituents a frank look at the 2017 state legislative session during his talk story on Tuesday. Big Island Video News. Community reacts to homelessness initiatives at forum. West Hawaii Today. Installing new grass, reviewing high administrative costs and assessing employee duties at the Waiehu Municipal Golf Course are some of the areas a Maui County Council committee will explore to help the island’s only public course increase revenue and decrease financial losses. Maui News. A $12 million expansion of the state’s harbormaster building and various improvements around the Lahaina Harbor received unanimous approval Tuesday from the Maui Planning Commission. Maui News. The owner of the South Maui Gardens Nursery is withdrawing his application for a commercial and residential development in Kihei, a surprise move after the project got the early go-ahead from the Maui Planning Commission Tuesday. Maui News. A Maui police sergeant says he took part in a scheme with another officer and a third person to bribe a witness who accused the other officer of stealing $1,800 from him. Star-Advertiser. The House Armed Services Committee approved a defense amendment Wednesday that would safeguard continued missile testing on Kauai and assess the effectiveness of a new medium-range radar before taking additional steps to protect Hawaii from North Korean threats such as activating the Aegis Ashore facility. Star-Advertiser. Hoola Lahui Hawaii on Kauai will receive $2.4 million as one of five grants awarded to the Native Hawaiian Health Care Systems programs totaling $10.6 million. Garden Island. July isn’t just the month that celebrates America’s independence. It’s also the month that celebrates Hawaiian sovereignty. Garden Island.